Sun safety is a key component of any day of fun in the sun involving kids, and sunscreen can help protect children’s skin from the sun’s harmful ultraviolet (UV) rays. However, it’s important to make sure the sunscreen you plan on tossing into your beach bag is safe. To help parents sidestep sunscreens that may not be entirely kid-safe, Healthy Child released a list of the 13 sunscreens with the worst EWG (Environmental Working Group) ratings for 2016. The kids’ and baby sunscreens on EWG’s list have potentially harmful chemicals, including oxybenzone (a hormone disrupter) and retinyl palmitate (a chemical that may speed the development of skin damage on sun-exposed skin). Several formulas come in an aerosol spray, which may provide inadequate skin coverage and introduce potentially hazardous chemicals into your little one’s lungs. Additionally, the sunscreens have SPFs of 50 or above. 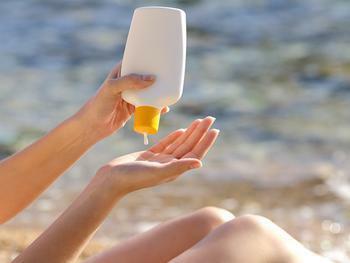 While you might think high SPF formulas offer added sun protection, the EWG contends that the opposite is true. High SPFs can suppress the skin reddening and pain or sunburns, raise the risk of other kinds of skin damage, and “give people a false sense of security and beguile them to stay in the sun too long,” according to the group. The best-scoring sunscreens for kids can be viewed here.